Just-disclosed campaign spending by the Greater New York Hospital Association sheds additional light on health-care funding developments in Albany last year. 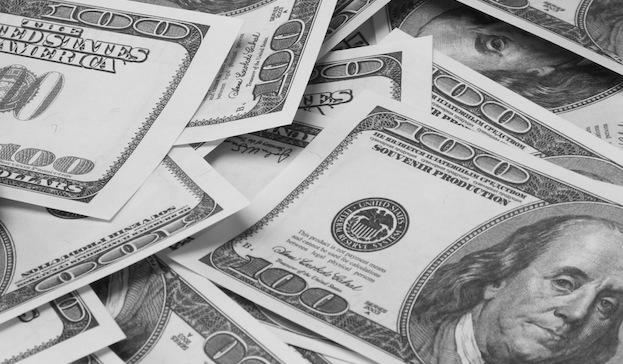 Filings with the state Board of Elections show that GNYHA Management Corp., an affiliate of the hospital and nursing home group, donated a total of $1.15 million to the “housekeeping” account of the state Democratic Committee in the latter half of 2018. The contributions, first reported by Crain’s New York, were far out of line with the group’s past pattern (see chart) and made it the party’s largest contributor for the six-month period, which included primary and general elections for all state offices. GNYHA also donated $100,000 to the same account in May. The state Democratic Committee is controlled by Governor Cuomo, and spent the bulk of its resources in support of his re-election. 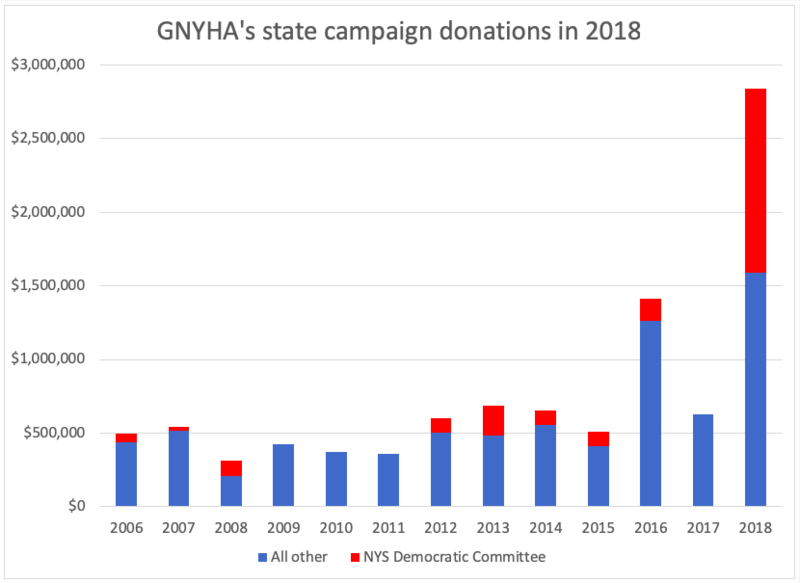 The GNYHA donations were not reported until now because they went to the party’s “housekeeping” account – a type of fund-raising vehicle that operates outside the normal rules. Such committees can accept contributions of any amount (the usual cap on corporate donations is $5,000) and they disclose their finances only twice a year, in January and July. Housekeeping committees are supposed to spend only on “party-building” activities, not campaigns, but the rule is vague and widely skirted. 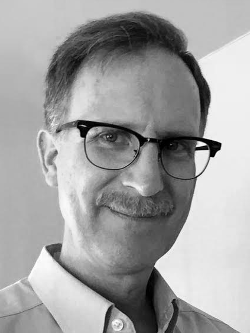 The seven-figure contribution surge happened not long before GNHYA achieved its top priority in Albany last year, which was securing additional state funding for its members. Most of GNYHA’s donations arrived in August and October – the time frame when the Cuomo administration was deciding how to spend $2 billion in proceeds from the sale of Fidelis Care to Centene Corp. The administration’s first allocation of the money, quietly revealed at the end of October, was an across-the-board boost in Medicaid payments to hospitals and nursing homes, many of which are GNYHA members. The move will cost the state an estimated $500 million over three years. With federal matching aid, hospitals and nursing homes statewide will see a total benefit of some $1 billion. That decision culminated a major lobbying effort by GNYHA and its ally, the health-care labor union 1199 SEIU. In January, the groups announced a campaign for increased state spending on health-care, in response to threatened cuts by the federal government. Echoing that message, Cuomo’s January budget proposal called for establishing a “Health Care Shortfall Fund” and filling it with revenues gleaned from the insurance industry. It soon became clear that overall federal health aid to New York would not be cut. But Cuomo pressed his case with support of the Healthcare Education Project, a joint enterprise of 1199 and GNYHA, which reported spending $3.5 million on its ad campaign. Cuomo ultimately prevailed on Fidelis and Centene to pay the state $2 billion over four years in exchange for approval of their transaction. Instead of a “shortfall” fund, the money went into a “Health Care Transformation Fund,” and the Cuomo administration was given free rein to spend it on any health-related purpose without consulting the Legislature. The Medicaid rate increases for hospitals and nursing homes were first announced with a notice in the New York State Register on Oct. 31 and took effect on Nov. 1. In amendments to the state Medicaid plan, filed on Dec. 28, officials said they planned across-the-board Medicaid rate increases of 2 percent for hospitals and 1.5 percent for nursing homes.